From the beginning, wearing a uniform has been part of Scouting. The uniform gives a sense of Pride and a send of Belonging. Each level of Scouting have slight differences in their uniform. 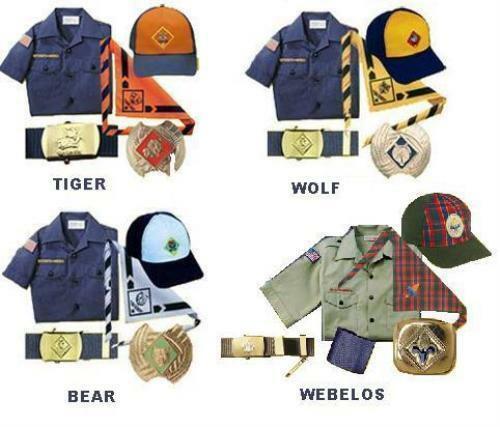 All kids that are Tigers, Wolves and Bears wear the blue uniforms. Each of their neckerchiefs are different colors, based on which den they are in. Webelos wear the khaki uniforms with the plaid neckerchief. All of these uniforms are called the scout's "Class A" uniform. Detailed pictures and scout shop locations are described in the attachment below. Please review the attachment and let any leader know if you have any questions about the uniforms. Staff at the scout shops are also extremely helpful in helping you purchase the items that you need for your scout. In addition to the "Class A" uniforms listed above, our pack sells a pack t-shirt (our "Class B" uniform) for scouts (1st one included in membership), parents and siblings to purchase. Class B uniforms can be worn at other events such as camping, hiking, Pinewood Derby, etc. Each additional t-shirt or family t-shirt sells for $12. Please let any leader know if you would like to purchase any t-shirts.